Not so with Tsavorite garnet. You can make it hot. It is not brittle, so it would take a lot to break it. And you don’t have to oil it. So we love this stone, and we have a fabulous supplier of very high grade Tsavorite garnet, so we can easily source this stone in round, marquise, and princess cut. We may even be able to source it in cushion cut. The size range is excellent, so no matter how big you want your stone, we can accommodate your desire. 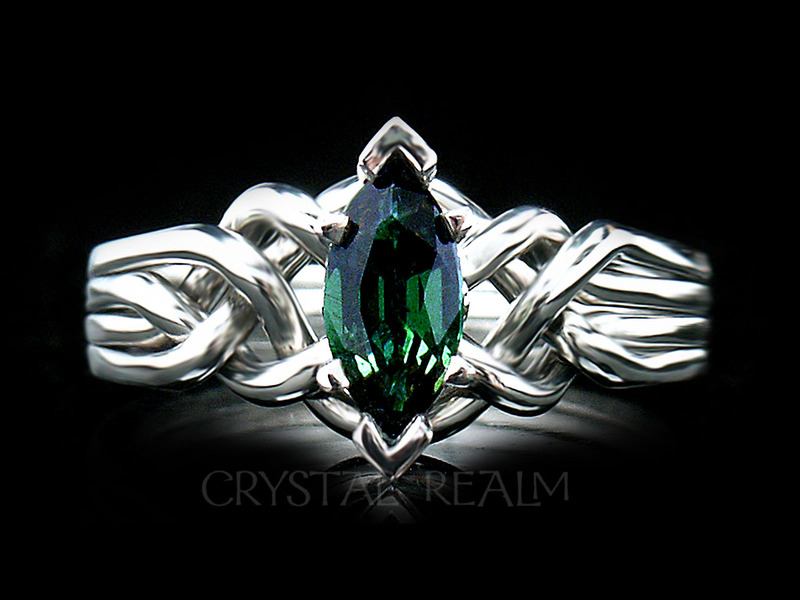 This ring is shown with a 1/2CT Tsavorite garnet. It’s on a four band, medium-weight puzzle ring with an open weave, and it’s paired with a shadow band made from an original hand-carved wax, made to go precisely with the very puzzle ring shown. 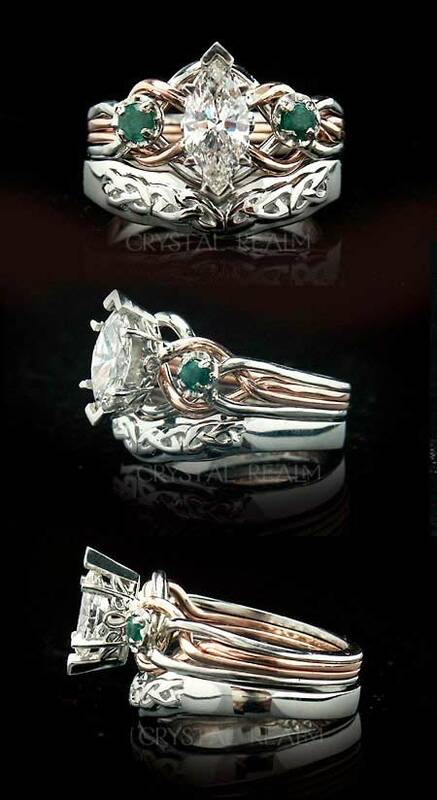 Marquise tsavorite garnet four band puzzle ring with 2mm shadow band bridal set shown in palladium. With a 1CT Tsavorite garnet, as shown below, on a 14K gold puzzle ring with a standard weave, the puzzle must be a bit heavier. This ring is shown in a medium heavy weight, in order to be strong enough to bear a stone of this weight. This particular Tsavorite garnet fairly glows! The same ring shown on the finger. It’s graceful and beautiful from every angle. Handcrafted four band puzzle ring with 1CT marquise green garnet in 14k yellow gold with 14k white gold setting shown on hand. Note the puzzle ring is made in a medium heavy weight necessary to hold the 1CT stone. 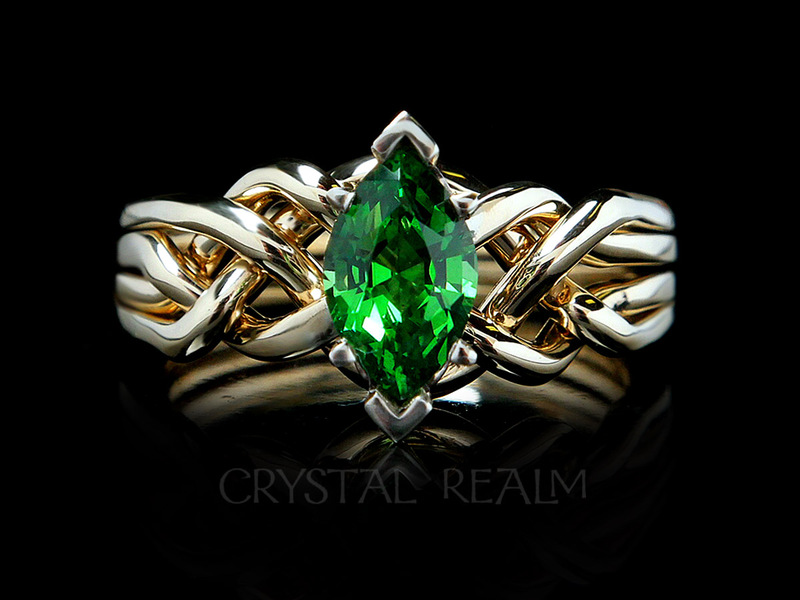 The ring below was the very first Tsavorite garnet puzzle ring we made. It’s in platinum. What impressed me the most, when I first saw this stone was the depth and variation of color in it. It had yellow green, it had blue green, it was really more vibrant than the photograph shows. It is notoriously difficult to photograph gemstones and diamonds! The Tsavorite garnets we get these days are not quite as dark as this one looks, more like the one set in the yellow gold puzzle ring shown above. 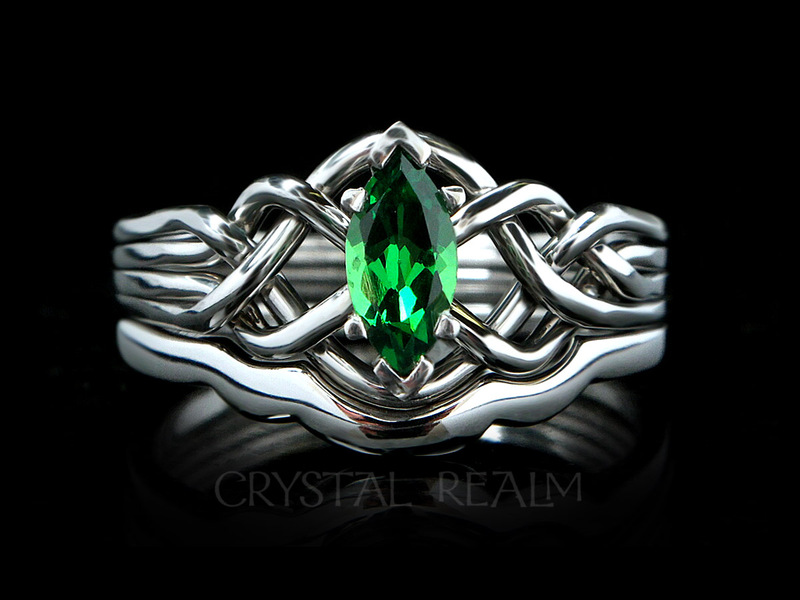 Four band puzzle ring with one half carat marquise tsavorite garnet with a standard weave on a medium weight puzzle ring. This ring is shown in platinum. 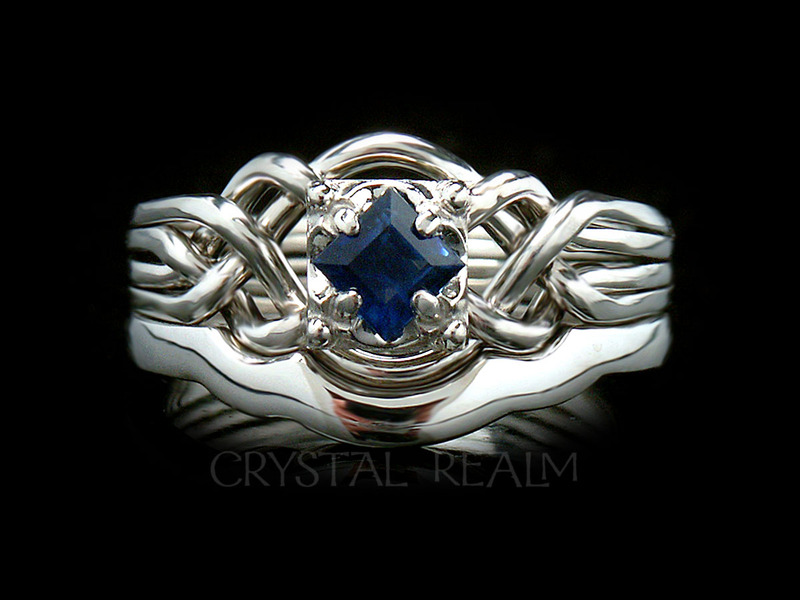 And here is one in a princess-cut in an Avalon setting. 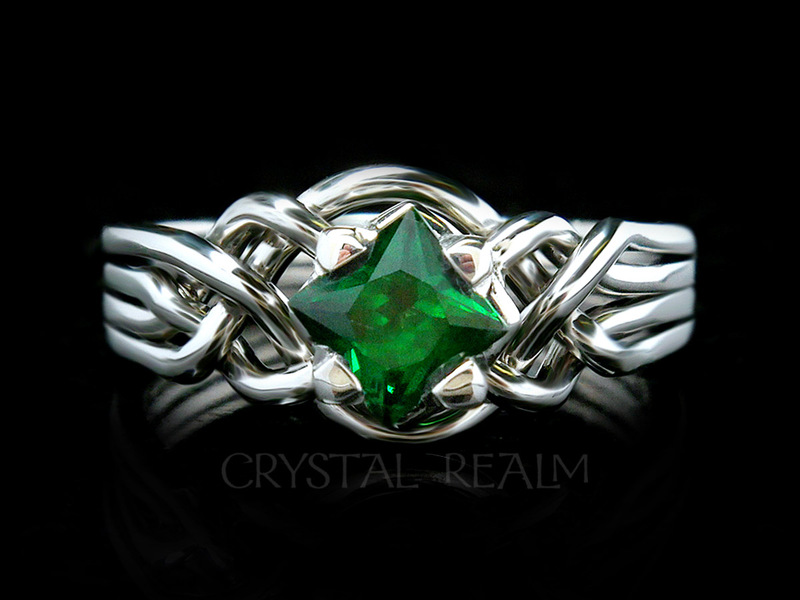 Four band, medium weight, puzzle ring with princess cut tsavorite green garnet in palladium. 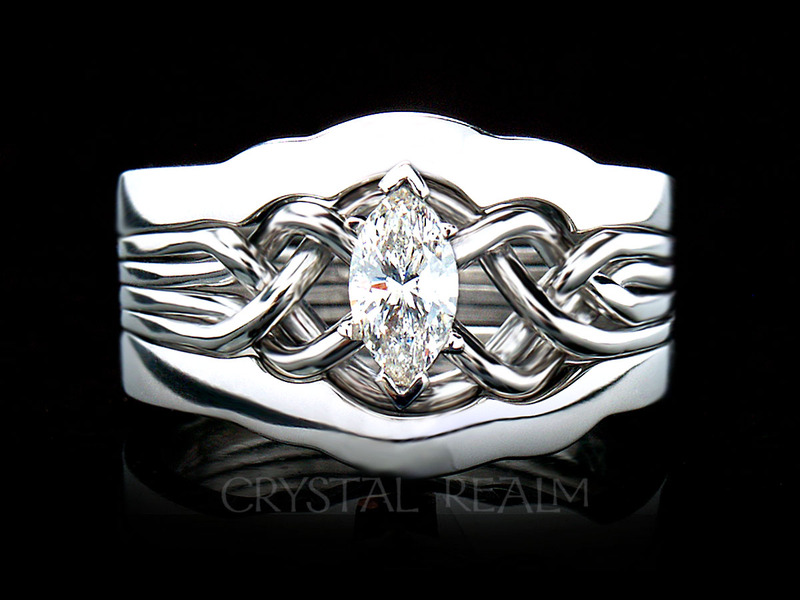 A heavy weight engagement puzzle ring with an open weave bears a one-carat marquise diamond. The wedding band is a 4mm, domed, comfort fit ring that is shaped to reflect the shape of the puzzle ring without being a shadow band that follows every ‘nook and cranny’ of the puzzle ring. It is one of our more ‘flashy’ bridal sets, and the customers we have made this for report they get a lot of attention for their engagement puzzle ring bridal set. One-carat marquise diamond on a heavy weight four band puzzle ring and paired with a 4mm wedding band shaped to fit with the puzzle ring. 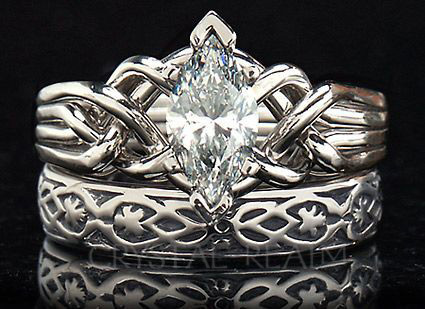 A Celtic knot-inspired engagement puzzle ring with a 3/4CT range marquise diamond makes an impressive statement. 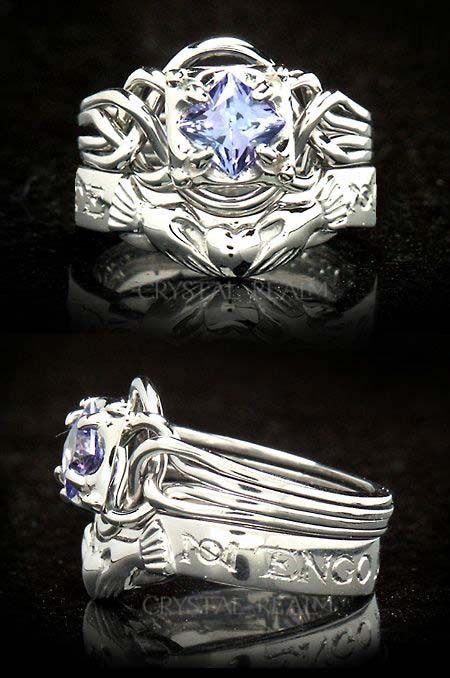 What a completely unique engagement ring. You will get so many compliments, as your friends and loved ones have never seen such a ring. Our brilliant puzzle ring maker has been hand-crafting engagement puzzle rings since 1972, and his work becomes more beautiful year by year. His work is in tremendous demand, and we are so blessed to be able to offer his work exclusively on our site. Marquise diamond engagement puzzle ring with 0.72CT diamond in medium weight 14K white gold. This is the largest size of diamond that the medium-weight puzzle ring, shown, can bear. On the other hand, it can hold a stone as small as a one-third carat. For a larger stone, we make the puzzle ring a little heavier, and for a very large stone (1.5CT and up), we will make it substantially heavier for you. 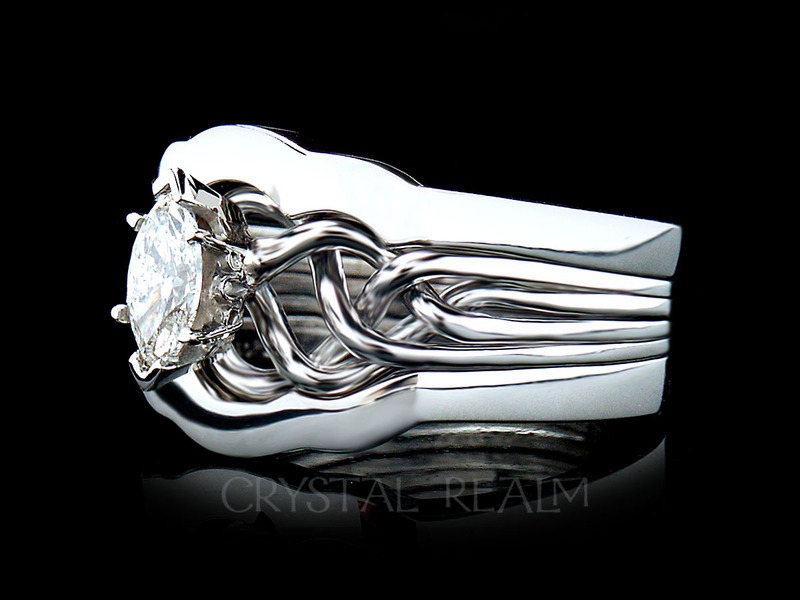 This engagement puzzle ring is shown with a standard weave. 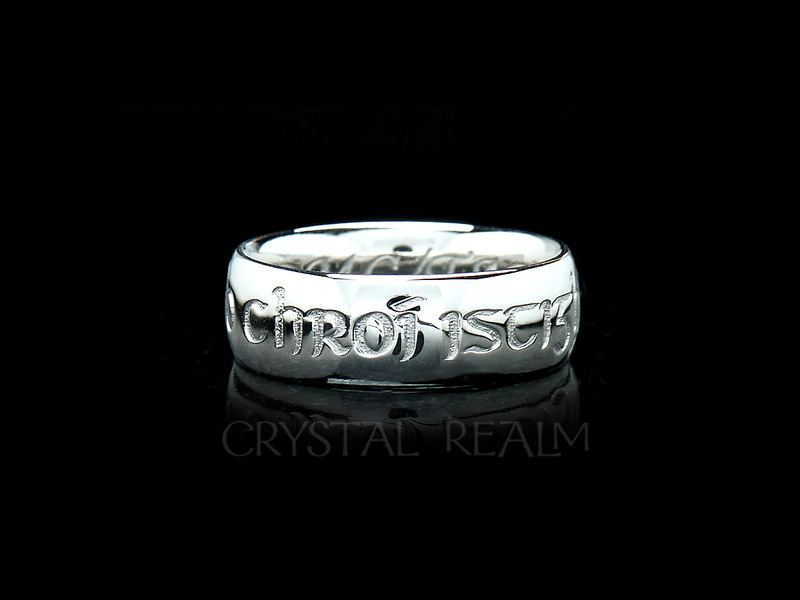 You may order this ring by clicking on the image to the left. Then choose your diamond size. Here is the very first shadow band that we ever made – we still think it is amazing. Our client wanted a wedding ring that would fit to the side of the puzzle ring. 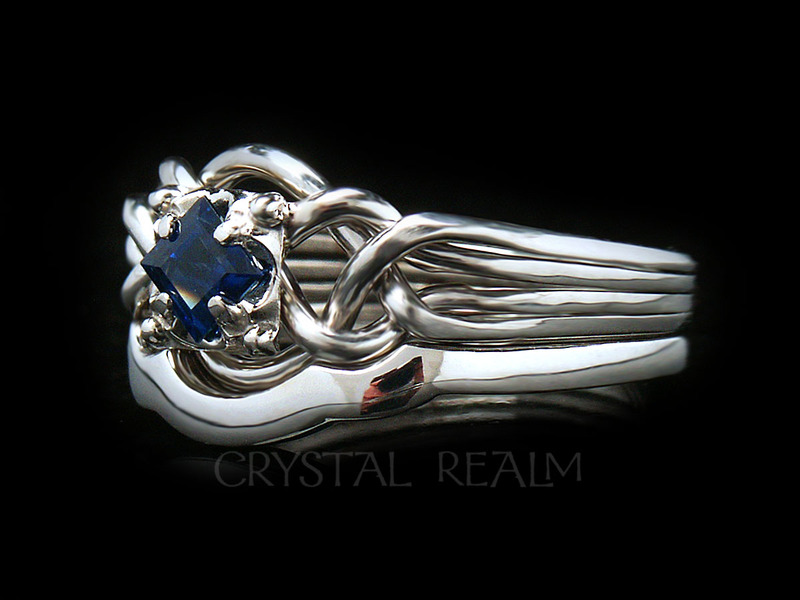 He wanted it to be suggestive of a claddagh band but without being an actual claddagh design. 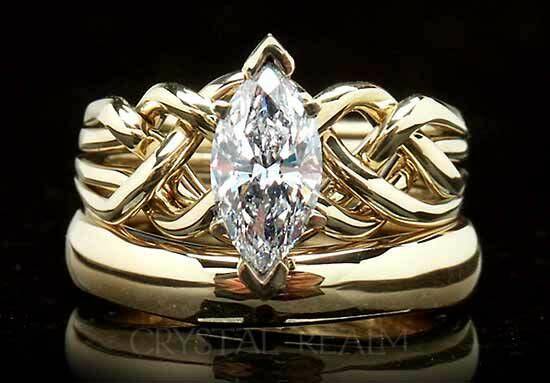 An Irish claddagh design includes hands, heart, and a crown meaning ‘may love and friendship reign.’ For this ring, we went with the hands and the heart. We still love the stylized hands with graceful wrists and cuffs. For this bridal set or for a set that we customize just for you . . . your choice of gemstone, your choice of words, your choice of precious metal (this is palladium) . . . please contact us directly at 1-866-573-7381 or from outside the U.S., call 1-505-898-1107. This hand-woven engagement puzzle ring is a truly unique piece, because the 1/2CT diamond is so long that it looks more like a 3/4CT diamond. In a marquise diamond, length and width is everything. Yes, the 2:1 length to width ratio that is considered to be ‘ideal’ is lovely. But when we find a diamond such as this one that is extra long, we jump at the chance to get it, as it will give the impression of a much larger diamond at a lower cost. There are three dimensions for a marquise diamond: length, width, and depth. An extra long marquise diamond may be a bit shallower than the next diamond. We find the length to be such an important characteristic that it can outweigh other diamond characteristics. For example, we normally select diamonds with only D-E-F color (top of range). But if we can find a diamond shaped like this one, we will even accept a color of G or H, with our client’s permission, of course. This engagement puzzle ring has four bands and an open weave – see how much air is seen between the front loops of the ring? An open puzzle ring weave like this is generally paired with a shadow band that follows each nook and cranny of the edge of the puzzle ring. 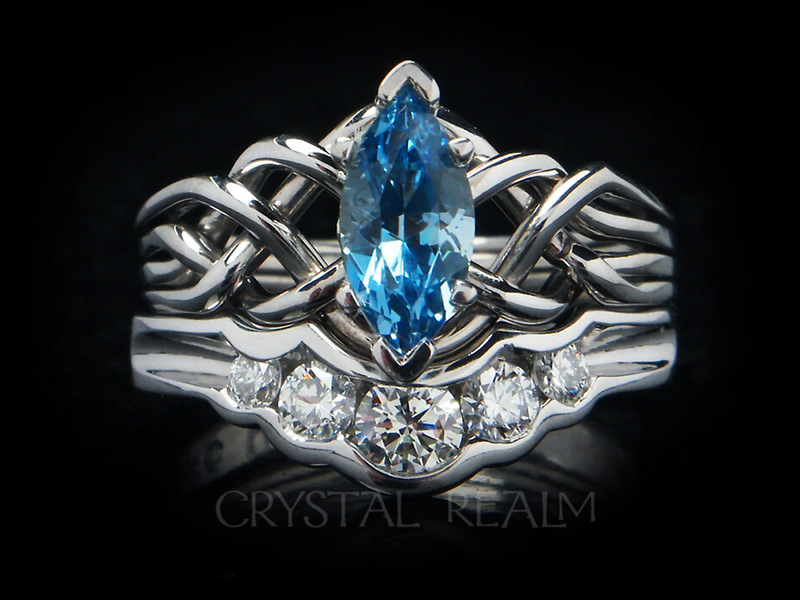 Both rings are entirely hand-made. Although we cannot promise we will find a half-carat diamond again with these dimensions, we will be happy to make you a set like this with a glorious, sparkling diamond that you will have the opportunity to approve before we set it in your bridal set. 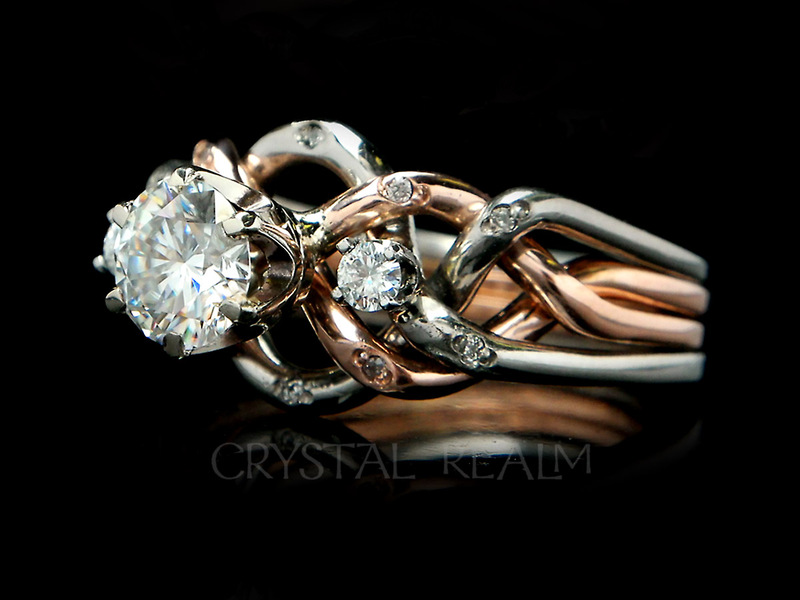 A rich 14K rose gold and platinum bridal set features a 0.71CT marquise diamond puzzle ring paired with an original Celtic knotwork shadow wedding ring. We sent this set to the Northwest coast of Australia. The puzzle ring is entirely hand-woven, meaning that each loop and curve of the puzzle ring is formed by hand by our expert puzzle ring maker. The shadow band is cast from a one-off, original hand-carved wax that is custom fit to the shape of the puzzle ring. You may choose any diamond size from 1/3CT up to 0.72CT. For a larger diamond, we will make the puzzle ring just a little heavier, and it will still pair well with this shadow band. For a smaller diamond, we will scale the shadow band down in width/weight a little bit to go perfectly with your puzzle ring. 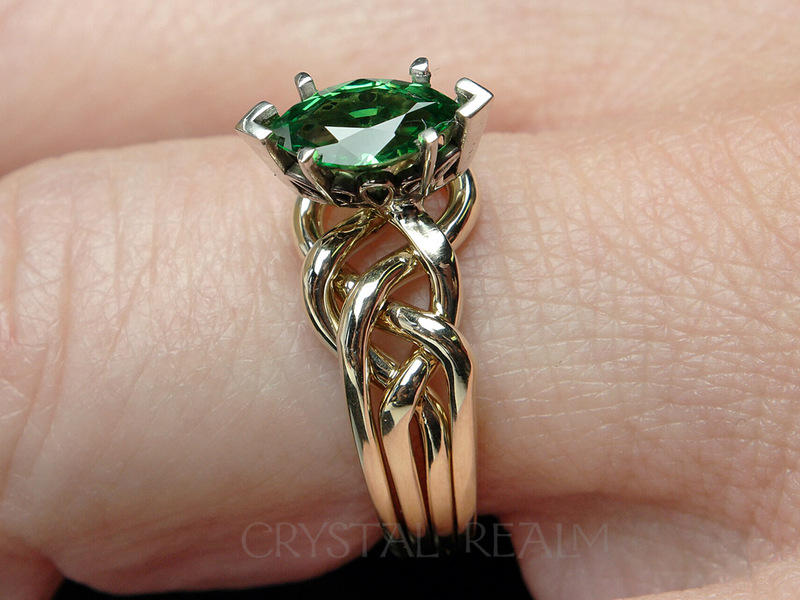 Marquise diamond and emerald engagement puzzle ring paired with a Celtic knotwork shadow band custom fit to the puzzle ring. The set is made of 14K rose gold and platinum. Please contact us directly at 1-866-573-7381 to order this set – or ask us to customize a set for you. Side sapphires or rubies? You got it. Center emerald or other colored gemstone – you bet! This engagement puzzle ring with a different shadow band – of course. 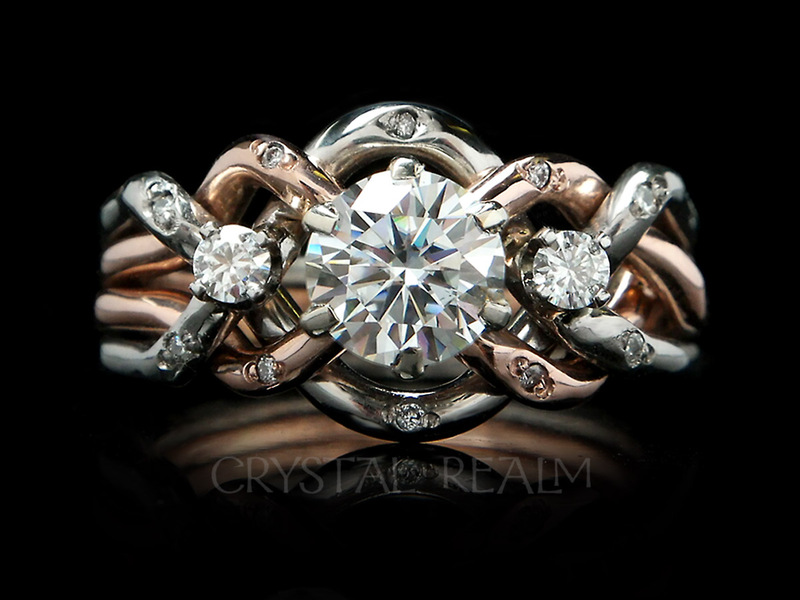 We live to create engagement puzzle rings and bridal sets for our customers – so you have exactly what you dream of. Our customers love to pair our engagement puzzle rings with posy rings for a unique bridal set exclusive to Crystal Realm. Different companies offer puzzle rings. Other companies offer posy rings. 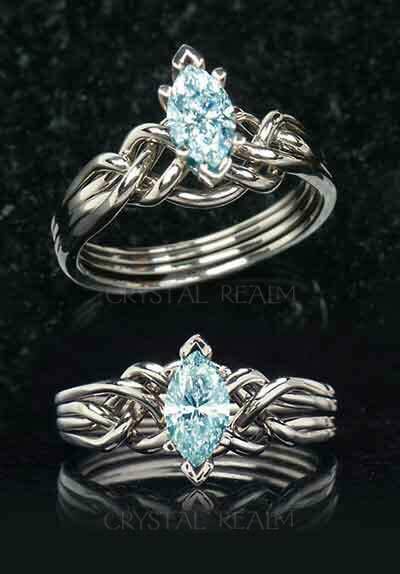 But only Crystal Realm offers bridal sets with puzzle rings and posy rings together. What makes our bridal sets so unique? First, our puzzle rings are not just any puzzle rings. Each one is custom hand-woven for the very stone shape and size that you select. We use round, marquise, and princess-cut stones to make our styles of puzzle rings. This means you may have any diamond or colored gemstone in a size from 0.33CT or larger on the puzzle ring of your choice. Then our handmade posy rings are matched to the puzzle ring for a bridal set you will find nowhere else. On this page, we show medium-weight, marquise diamond puzzle rings paired with a very special posy ring. 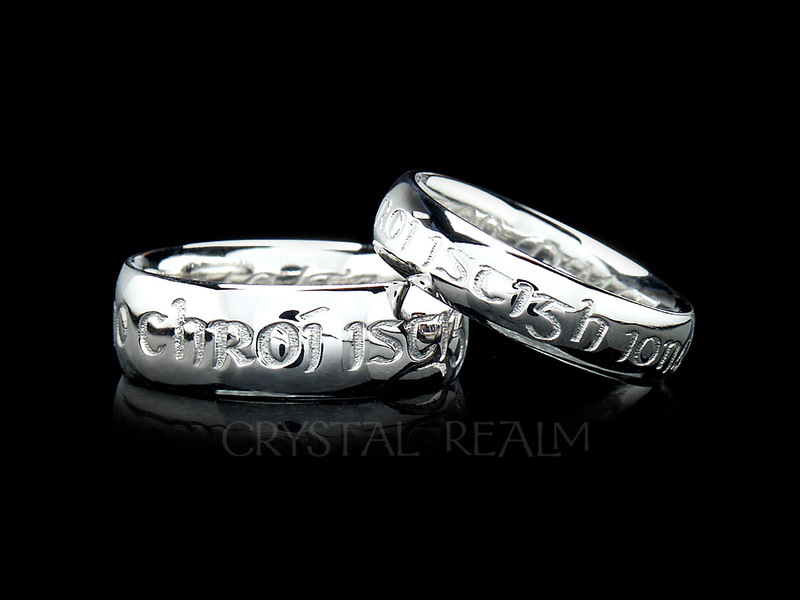 One of our most beloved posy rings is the Renaissance reproduction ring: yovrs onli, in 16th C. period English spelling. This posy ring is a reproduction of an original now found in the British Museum. 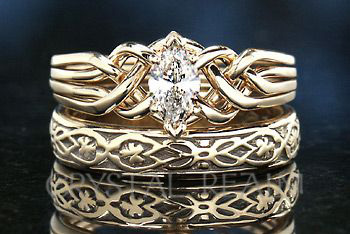 On the outside of this posy ring is a stunning Celtic design that looks gorgeous in every color of gold. Marquise diamond, four band puzzle ring with a ‘yovrs onli’ English Renaissance reproduction posy ring. The diamond size is 0.46CT, and this ring can hold up to a 0.72CT diamond, as shown below. A 0.72CT, marquise diamond, four band puzzle ring is paired with a yovrs onli posy ring, all in 14K white gold. You may order this set with a diamond size starting at 1/3CT. For a diamond larger than 0.72CT, we will make the puzzle ring just a little heavier, and it will still look beautiful with this posy ring. All of our posy rings are available with or without antiquing. 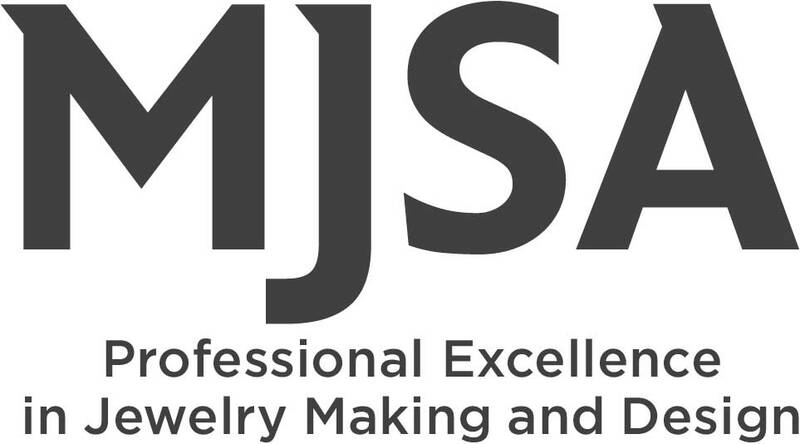 The antiquing is the slight darkening of the letters or the design elements of a posy ring. Both of the posy rings shown on this page are antiqued. The puzzle rings shown on this page were woven with a standard weave. 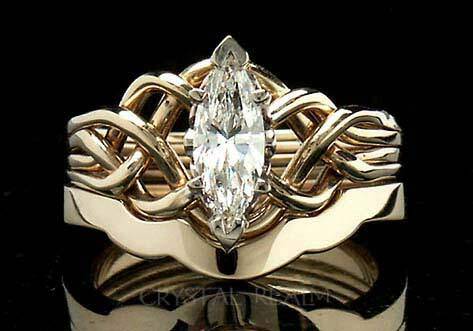 See marquise puzzle ring weave choices. To order either bridal set shown on this page, please call 1-866-573-7381 or contact us by email. 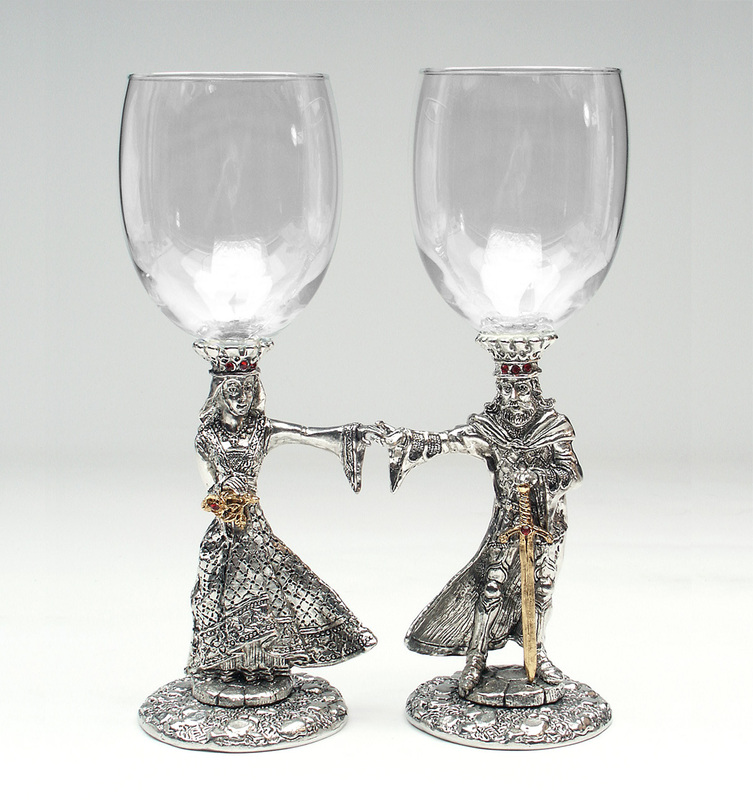 This heart shaped pair of purple toasting glasses is resplendent in pewter, crystal, and 23K gold. Guinevere’s dress is finely detailed; she holds a 23K gold plated rose accented with an Austrian crystal, and Austrian crystals adorn her crown. A beautiful purse hangs from her belt. Arthur is dressed in a cape with a dragon finely inscribed on the back. Chain mail shows through the slits in his sleeves. He holds a 23K gold plated sword, and his crown is also studded with Austrian crystals. 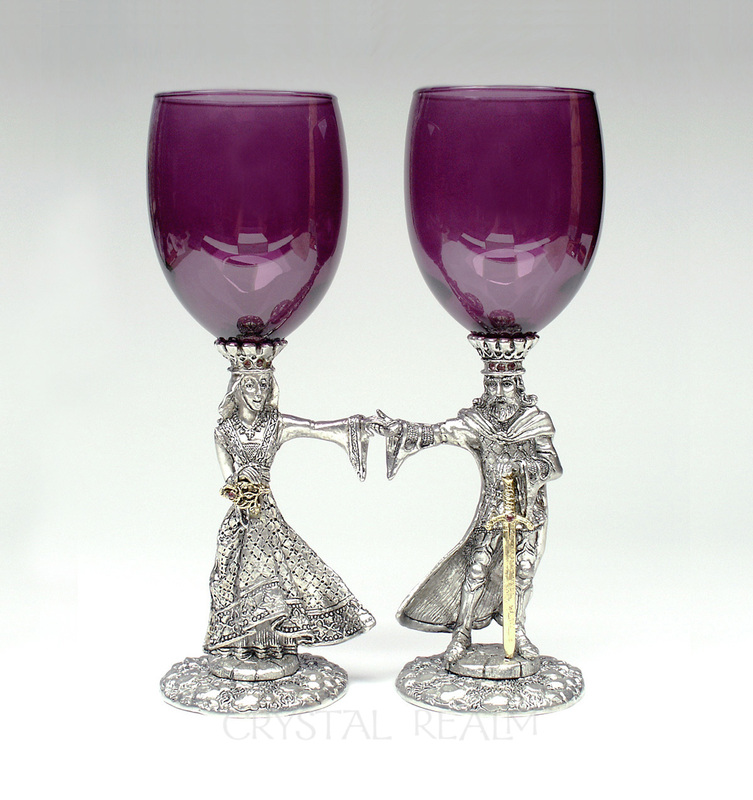 Together on your banquet table, these purple toasting glasses form a heart in the space between them. When you separate them and pick up each glass, you’ll find they are comfortable to hold. Hand-made to your order, they are sure to impress on your special day. We usually ship in two to four weeks, so please plan to order early enough for delivery. These glasses each hold 12 oz. when filled to the brim, so realistically, you may pour about 10 oz.